Liisa Hallamaa (neé Larsen, later Walden) born 1925. After completing her studies at Central School of Applied Arts (1949), she joined Arabia in 1950 and worked at Arabia Art Department until 1970. 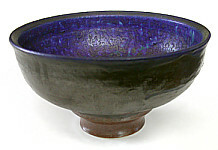 At Arabia she specialized in materials, thrown-methods and glazes. 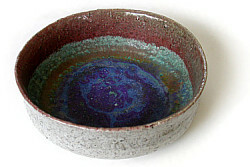 - Specially in her glazes she shows excellent colour sense. 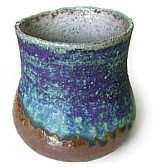 After leaving Arabia, during the years 1974-80, Hallamaa designed and made art ceramics for her own Studio Alamaa, located in a small village in central Finland. Hallamaa exhibited in Finland numerous times (Solo exhibition in Helsinki 1957, 1970, 1979) and abroad e.g. in Milano (1957 and 1960), Syracusa, USA and New York 1958; Faenza 1964, Japan 1965, Tokyo 1970, Australia 1968, and Germany 1970. She was awarded with Silver Medal in Cannes (1955), Vallauris Usine L'hosfield de Golfe Juan Award (1970), Faenza Gold Medal (1971) and Japan Gold Medal (1970 and 1973).